“God exists” is truth; it corresponds to reality and states that an all powerful Being exists in the real world. “God raised Jesus Christ from the dead” is also truth; it states that the Person who is Christ Jesus once died, but that He was resurrected from the dead by the power of God. These truths are not open to interpretation or to varying perspectives, nor will it comply with the will and, or desire of mankind. Truth in this sense is immutable, that is, it cannot change, any more than God Himself can change. This is why in a court of law (where truth is imperative in order to determine justice) the oath is taken, “Do you swear to tell the truth, the whole truth and nothing but the truth, so help you God?” – Interesting how they want to take “God”, the One who IS Truth out of that oath! To tell something less than the whole truth is an omission of truth, and therefore the entire truth is not known. I can tell you that a man assaulted me violently, and you could sympathize with my victimization. However if I neglect to tell you that I tried to pick pocket his wallet, I have deceived you by omitting pertinent information, and so you have a false perception of reality. I can tell you something more than the whole truth by adding some fabrication; perhaps I tell you that I could bench press 250 lbs, when in fact, I can’t even lift 220 lbs. This of course leads to the false impression that I am stronger than I really am. 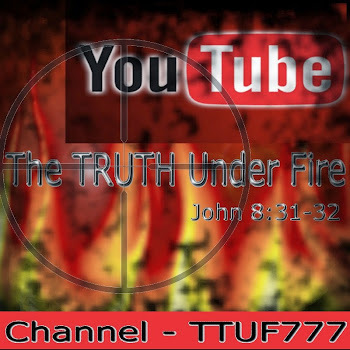 Those who would take away from God’s Word of Truth, or add to the same, are involved, knowingly or not, in deception! One popular theory is the pragmatic view of William James and his followers: truth is what works. 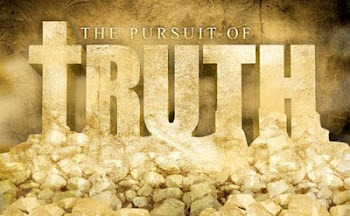 According to James, “Truth is the expedient in the way of knowing. A statement is known to be true if it brings the right results. It is the expedient as confirmed by future experience.” That this is inadequate is evident from its confusion of cause and effect. If something is true it will work, at least in the long run. Simply because something works, it doesn’t make it true. In a court of law, judges tend to regard the expedient as perjury. The results don’t settle the truth question either; even when results are in, one can still ask whether the initial statement corresponded to the facts, If it did not, it was not true, regardless of the results. If truth is absolute, then whether or not something is expedient for me, what determines one’s course of action will be, Is it right or wrong? Is this in accordance with moral truth? If a particular course of action will prove a disadvantage to me, but it’s the right thing to do, we must ‘bite the bullet’ and commit a self-sacrificial act for the good of truth and right. “All wives are married women” is internally consistent, but is empty. It tells us nothing of reality. The statement would be so even if there were no wives. It really means “IF there is a wife, then she must be married.” But it does not inform us that there is a wife anywhere in the universe. A set of false statements also can be internally consistent. IF several witnesses conspire to misrepresent the facts, their story may cohere better than if they were honestly trying to reconstruct the truth. But it is still a lie. At best, coherence is a negative test of truth. Statements are wrong if they are inconsistent, but necessarily true if they are. The world such as the one we live in is composed of universal, over-arching lies which are all (rudimentary) consistent with one another; one could perceive (erroneously) that this must be the truth. The world’s religions seem to have a central belief that salvation is by works, and yet because all of them are consistent, in this regard, one could conclude that there is some truth to this supposition (and that the biblical doctrine of salvation by grace (unmerited favor) is incorrect since it’s inconsistent with all of the world’s religious beliefs). Likewise, in our ‘global village’ it’s perceived that the only way for mankind to survive is to become united, to live “in a world without borders” and because we are hearing this in such repetitive fashion, it’s assumed that such must be the truth. It would seem that a coalescence of consensus in the realms of politics, religion, economics, philosophy, sociology and psychology is happening before our very eyes, and in the overwhelming majority of the masses, one would require a considerable amount of fortitude to withstand and oppose such a societal tsunami. Where would one acquire such fortitude? Let thy mercies come also unto me, O LORD, even thy salvation, according to thy word. So shall I have wherewith to answer him that reproacheth me: for I trust in thy word. And take not the word of truth utterly out of my mouth; for I have hoped in thy judgments. Another idea is that the view that explains the most data is true. And those that are not as comprehensive are not true – or not as true. Comprehensiveness is one test for truth but not the definition of truth. Certainly a good theory will explain all relevant data. And a true worldview will be comprehensive. However, this is only a negative test of whether it is true. The affirmations of that view must still correspond with the real state of affairs. If a view was true simply because it was more encyclopedic, then a comprehensive statement of error would be true and a digested presentation of truth automatically would be in error. Not all long winded presentations are true and concise ones are not all false or superficial or incomplete view of what is true. Following Soren Kierkegaard and other existential philosophers, some have insisted that truth is what is relevant to our existence or life and false if it is not. Truth is subjectivity, Kierkegaard said; truth is livable. As Martin Buber stated, truth is found in persons, not in propositions. However, even if truth is existential in some sense, not all truth fits into the existential category. There are many kinds of truth, physical, mathematical, historical, theoretical, etc. But if truth by its very nature is found only subjectively in existential relevance, then none of these could be true. What is true will be relevant, but not everything relevant is true. A pen is relevant to an atheist writer. And a gun is relevant to a murderer. But this does not make the former true or the latter good. A truth about life will be relevant to life. But not everything relevant to one’s life will be true. Mystical experiences can be wonderful and seemingly good, and if people experience these in reality, they supposedly must therefore be true. However, this is not the case. The belief systems that formulate in the mystical practitioners mind’s do not correspond to the truth found in God’s Word, but rather correspond to the same kind of ‘mystical truth’ as found in Hinduism and New Spirituality and New Thought beliefs. ‘Relevance’ is a term leaned heavily upon by Emergent Church leaders and authors as well and they make the claim that because their beliefs are relevant to our changing culture and speaks to “our needs” that they are therefore true. This is a false assertion. It is evident that bad news can be true. But if what feels good is always true, then we would not have to believe anything unpleasant. Bad report cards do not make a student feel good, but the student refuses to believe them at his or her academic peril. They are true. Feelings are also relative to individual personalities. What feels good to one may feel bad to another. If so, then truth would be highly relative. But, as will be seen in some detail, truth CANNOT be relative. Correspondence with reality: Now that the inadequate views of the nature of truth have been examined, it remains to state an adequate view. Truth is “telling it like it is”. This correspondence applies to abstract realities as well as actual ones. There are mathematical truths; there are also truths about ideas. In each case there is a reality, and truth accurately expresses it. Falsehood, then, is what does not correspond. It tells it like it is not, misrepresenting the way things are. The intent behind the statement is irrelevant. If it lacks proper correspondence, then it is false. All non-correspondence views of truth imply correspondence, even if they attempt to deny it. The claim ‘Truth does not correspond with what is’ implies that this view corresponds with reality. Then the non-correspondence view cannot express itself without using a correspondence frame of reference. In other words, in an attempt to deny correspondence, it has to use such a statement in the denial that implies correspondence! Essentially, ‘Truth does not correspond with what is’ is a self contradictory statement. If one’s factual statements need not correspond to the facts in order to be true, then any factually incorrect statement is acceptable. It becomes impossible to lie. Any statement is compatible with any given state of affairs. Also, if everything is true, then nothing is, quite simply because within the framework of ‘everything being true’ there would exist contradictory truths, and truth cannot contradict itself. Communication depends on the informative statements. But correspondence to facts is what makes statements informative. All communication ultimately depends on something being literally or factually true. We cannot even use a metaphor unless we understand that there is a literal meaning over against which the figurative sense is not literal. For example, it’s been often argued by those who don’t believe in a literal hell, that “‘Gehenna’, a refuse field outside of Jerusalem, does not correspond to an actual place of torment, of eternal flames and punishment; it’s simply a metaphor” and the statement is left at that. However a metaphor expresses a truth that must correspond to reality, if it does not, then it remains static (no basis for truth) and is meaningless. So, it would follow that all communication depends in the final analysis on a correspondence to truth. When Jesus said, “I am the truth” (JOHN 14:6), it is argued that His demonstration of truth is personal, not propositional. This would seem to falsify the correspondence view of truth, in which truth is a characteristic of propositions (or expressions) which correspond to its referent. But a person, as well as a proposition, can correspond with reality. As the ‘exact image’ of the invisible God (HEB 1:3), Jesus perfectly corresponds to the Father (JOHN 1:18). He said to Philip “when you have seen Me, you have seen the Father” (JOHN 14:9). So, a person can correspond to another in his character and actions. In this sense, persons can be said to be true, or express the truth. God is truth, yet there is nothing outside of Himself to which He corresponds. Yet according to the correspondence view, truth is that which correctly represents reality. Since God lacks correspondence, so this argument goes, the correspondence theory denies that God is true, as the Bible says He is (ROM 3:4). However, truth as correspondence does relate strongly to God. God’s words correspond to His thoughts. So God is true in the sense that His Word can be trusted. God’s thoughts are identical to themselves, a kind of perfect “correspondence”. In this sense, God is true to Himself. If truth is understood as that which corresponds to another, then in this sense God is not “true”. Rather, He is the ultimate reality and so the standard for truth. Other things must correspond to Him in a limited way in order to be called true, not He to them. Along with Dr. Geisler’s remarks, I may add that the truth in correspondence is readily acknowledged in the fact that all Three Persons of the Triune Godhead correspond to One Another, with no variation or dichotomy among Them. What One declares, the Others affirm, and all that issues from God is true. The relativity of truth is commonly a premise of current thought. Yet orthodox Christianity is predicated on the position that truth is absolute. Thus, the defense of the possibility of absolute truth is crucial to the defense of the historic Christian faith. According to theories of relative truth, something may be true for one person, but not for all people. Or, it may be true at one time, but not at another. According to the absolutist view, what is true for one person is true for all persons, times and places. As argued above, there is only one adequate view of the nature of truth – the correspondence view. Nancy Missler, wife of Dr. Chuck Missler, after studying the scriptures on ‘truth’ came to the conclusion that truth is “when the word and the deed become one”. Other views, such as coherence and pragmatism, describe tests for truth, not as explanation of the nature of truth itself. Factual truth is that which corresponds to the facts. It is that which corresponds to the actual state of affairs being described. Of all, some things appear only to be true at some times and not at others, For example, many people once believed the world to be flat. Now we know that truth statement was wrong. It would seem that this truth has changed with the times. Or has it? Did the truth change, or did beliefs about what is true change? Well, certainly the world did not change from a box to a sphere. What changed in this regard is our belief, not our earth. It changed from a false belief to a true one. Within a statement’s ‘universe of discourse’, every truth is an absolute truth. Some statements really apply only to some people, but the truth of those statements is just as absolute for all people everywhere at all times as a statement that applies to all people generally: “Daily injections of insulin are essential for continued life” is true of persons with some life-threatening forms of diabetes. This statement has an applied ‘universe of discourse’. It isn’t purporting to be a truth that applies to everyone, but if it applies to Fred, then it is true of Fred, for everyone (that is, ‘for continued life, it is essential that Fred must receive daily injections of insulin’). The caveat that this statement is false for people with a normally functioning pancreas does not detract from the statement’s truth within its ‘universe of discourse’ – diabetics to whom it is properly addressed. Some statements appear to be true only for some. The statement, “I feel warm” may be true for me but not for another person, who may feel cold. I am only one within the statement’s ‘universe of discourse’. The statement “I [Norman Geisler] feel warm” (on July 1, 1998 at 3:37 p.m.) is true for everyone every where that Norman Geisler did feel warm at that moment in history. It corresponds to facts and so is an absolute truth. Most relativists really believe that relativism is true for everybody, not just for them. But that is the one thing they cannot hold if they are really relativists; for a relative truth is just true for me but not necessarily for any one else. So, the relativist who thinks relativism is true . . . for everyone . . . is an absolutist. Such a person believes in at least one absolute truth. Herein lays the self-destructive nature of relativism: the relativist stands on the pinnacle of an absolute truth and wants to relativize everything else. If relativism were true, then the world would be full of contradictory conditions. If something were to be true for me but false for you, then opposite conditions exist. If Billy Graham says “God exists” and Madalyn Murray O’Hare says “God doesn’t exist” and both are relatively true, then God existing and non-existing would by necessity be co-existing. This does not correspond with reality. If relativism is true then no one is ever wrong – even if they are. As long as something is true to me, then I’m right even when I’m wrong. The drawback is that I could never learn anything either, because learning is moving from a false belief to an absolutely true one. The truth is that absolutes are inescapable. No Absolute Knowledge: It is objected that truth cannot be absolute since we do not have an absolute knowledge of truths. Even most absolutists admit that most things are known only in terms of degrees of probability. How then, can all truth be absolute? We can be absolutely sure of some things, I am absolutely sure that I exist. In fact, my existence is undeniable. For I would have to exist in order to make the statement, “I do not exist”. I am also absolutely sure that I cannot exist and not exist at the same time. And that there are no square circles. And that 3 + 2 = 5. There are many more things of which I am not absolutely certain. But even here the relativist is misguided in rejecting absolute truth simply because we lack absolute evidence that some things are true. The truth can be absolute no matter what our grounds for believing it. For example, if it is true that Sidney, Australia is on the Pacific Ocean, then it is absolutely true no matter what my evidence or lack of evidence may be. An absolute truth is absolutely true in itself, no matter what evidence there is. Evidence or lack thereof, does not change a fact. And truth doesn’t change just because we learn something more about it. In-between Truths: Another objection is that many things are comparative – like relative sizes such as shorter and taller. As such they cannot be absolute truths, since they change depending on the object to which they relate. For example, some people are good compared to Hitler but evil compared to Mother Theresa. Contrary to the claim of relativists, in-between things do not disprove absolutism. For the facts that “John is shorter in relation to an NBA player”, and “John is tall compared to a jockey” are absolutely true for all times, and all people. John is in-between in size, and it depends on which one to whom he is compared whether he is shorter or taller. Nonetheless, it absolutely true that John (being five feet ten inches) is short compared to most basketball players and tall compared to the majority of jockeys. The same is true of other in-between things such as warmer or colder, and better or worse. No New Truth (or Progress): If truth never changes, then there can’t be any new truth. This would mean that no progress is possible. But we do come to know new truths. That is what scientific discovery is all about. In response to this, “new truth” can be understood in two ways. It might mean “new to us”, like a new discovery in science. But that is only a matter of us discovering an ‘old truth’. After all, the law of gravity was there long before Isaac Newton. Many truths have always been there, but we are just finding out about them. The other way we might understand “new truth” is that something new has come into existence that makes it possible to make a new statement about it that is only then true for the first time. That’s no problem either. When January 1, 2020 arrives, a new truth will be born. Until that day it will not be true to say “This is January 1st, 2020”; but when that happens it will be true for all people and places forever more. So ‘old’ truths don’t change and neither do “new truths” when they come to pass. Once it is true, it is always true – for every one. Truth and Growth in Knowledge: It is also objected that knowledge of truth is not absolute, since we grow in truth. What is true today may be false tomorrow. The progress of science is proof that truth is constantly changing. This objection fails to note that it is not the truth that is changing but our understanding of it. When science truly progresses, it does not move from an old truth to a new truth, but from error to truth. When Copernicus argued that the earth moves around the sun, and not the reverse, truth did not change. What changed was the scientific understanding about what moves around what. Narrow Absolutes: Of course truth is narrow. There is only one answer for what is 4 + 4. It is not 1. It is not 2,3,4,5,6,7, 9, or 10 or any other number. It is only 8. That’s narrow but it’s correct. Dave Hunt is fond of saying that since relativists don’t adhere to absolutes, the next time they take a flight aboard an airliner, they shouldn’t be at all alarmed if the pilots states over the intercom, “I’ve gone to flight school and they trained me how to fly a plane, and day in and day out, I have flown any plane I’ve ever piloted, exactly the same way, and its rather boring, not to mention rather narrow minded. So, today I’m going to try something different, and just wing it; I’ll just go ahead and take off and once we are airborne, I’ll push whatever button or switch that comes to mind, and I’m sure it will all work out just fine. Whatever the means, we’ll get to our destination!” How many relativists would book another flight? Non-Christians often claim that Christians are too narrow-minded because they claim that Christianity is true and all non-Christian systems are false. However, the same is true of non-Christians who claim that what they view as truth is true, and all opposing beliefs are false. That is equally narrow. The fact of the matter is that if C (Christianity) is true, then it follows that all non-C are false. Likewise if H (Humanism) is true, then all non-H is false. Both views are equally narrow. That’s the way truth is. Each truth-claim excludes contradictory truth-claims. Christianity is no more narrow than is any other set of beliefs, whether “atheism, agnosticism, skepticism, or pantheism”. Dogmatic Absolutes: The claim that those who believe in absolute truth are dogmatic misses the point. If all truth is absolute – true for all people, times, places – everyone who claims anything that is true is ‘dogmatic’. Even the relativist who claims relativism is true is dogmatic. This person claims to own the only absolute truth that can be uttered, namely that everything else is relative. Something important is overlooked in this charge of dogmatism; there is a big difference between the pejorative charge that belief in absolute truth is dogmatic and the manner in which someone may hold to this belief. No doubt the manner with which many absolutists have held to and conveyed their beliefs has been less than humble. However, no agnostic would consider it a telling argument against agnosticism that some agnostics communicate their beliefs in a dogmatic manner. Nonetheless, there is an important distinction to keep in mind: Truth is absolute, but our grasp of it is not. Just because there is absolute truth does not mean that our understanding of it is absolute. This fact itself should cause the absolutists to temper convictions with humility; for while truth is absolute our understanding of absolute truth is not absolute. As finite creatures, we grow in our understanding of the Truth. May I add that the one Person who does have a total comprehension and understanding of absolute truth is God Himself. Because God is all-knowing, it’s impossible for Him to learn. This also means that while our own comprehension and understanding of truth is finite, we can place implicit trust in the One who knows all that which corresponds to reality, as the Maker and Sustainer of reality. Faith in God and the truth of God’s Word is valid, sound, and justified. Truth may be tested in many ways but it should be understood in only one way. There is one reality to which statements or ideas must conform in order to be regarded as true. There may be many different ways to defend different truth claims, but there is really only one proper way to define truth, namely, as correspondence. The confusion between the nature of truth and the verification of truth is at the heart of the rejection of a correspondence view of truth. Likewise there is a difference between what truth is and what true does. Truth is correspondence, but truth has certain consequences. Truth itself should not be confused with its results or with its application. The failure to make this distinction leads to wrong view of the nature of truth. Truth is that which corresponds to reality or to the state of affairs it purports to describe. And falsehood is what does not correspond. This article was reproduced in part from Baker’s Encyclopedia of Apologetics with Dr. Norman Geisler. Matthew Henry rightly states that such fakes and false doctrines must be opposed; "Faithful ministers must oppose such in good time, that their folly being made manifest, they may go no further They had a base end in what they did; serving a worldly interest under pretence of religion: for the love of money is the root of all evil. Such should be resisted, and put to shame, by sound doctrine from the Scriptures." The Gospel Good News is straightforward; believe in Jesus (John 3:16), follow Jesus (John 8:32), live and love like Jesus (Matthew 25:40). The Forerunner Commentary points out that a great many fakes preach and lead people away from the Gospel; "A number of years ago, a Protestant pastor commented that the church has become good at turning wine into water. In many cases, modern Christian services and teachings are nothing more than entertaining paganism and in other cases, a Sunday morning fraternal organization."